"Every Dog Wants To Be A Superdog. Together We Can Make It Happen!" On the first weekend in December, there was a NADAC Agility Trial in Calgary hosted by "It's a Dog's World". The Superdog Spectrum's talented agility instructor, Shannen Jorgenson, along with her husband, Jack, entered some of their hot competition dogs. Jack's dog, Riddle, had an outstanding run in jumpers and won the class handily with a 21 second clean run! Shannen's rising papillon star, Sizzle, made her debut running in novice jumpers and novice tunnelers. Sizzle ran clean in both classes and won her jumpers class in a sizzling 23 seconds! We always suspected that was how she got her name. Keon, who was last June's novice papillon pick, qualified in each of his 4 runs (2 open standard, 1 open jumpers and 1 open tunnelers) and won his class every round. He also had the fastest open tunnelers run form all the classes. Also, we might mention here that the Jorgensens recently welcomed a new addition to their Papillon family. He is a mature boy who came all the way from Switzerland to live out his retirement years with Jack & Shannen. He came with a name, but it's a secret because if Shannon runs true to form, he will be christened with something descriptive and special. Plans are underway for him to be bred to Ian & Mickey's little papillon girl, Stitch. They are sure pleased with him and look forward to his fur kids becoming great agility dogs someday. What an outstanding string of little agility "butterfly dogs" Shannen is developing! Obesity among dogs is a common problem...and a serious one... as it creates a greater risk for other medical problems. How do you tell if your dog is overweight? Following are a few tips that will help you determine if his weight is healthy or not. Check your dog's ribs. First, stand above your dog and look down at him. Behind his ribs there should be a visible indentation. Next, place both your hands on his ribs. You should be able to feel them but they shouldn't be visible. If your dog's ribs stick out visibly then chances are he is underweight. If you can't feel his ribs chances are that he is overweight. Your veterinarian can weigh your dog on a platform scale, specifically designed for pets. If you have a small-sized dog you can also weigh him at home. Pick him up and step on your home scale. Check your joint weight, then put your dog down. Step on the scale again, alone. Check your weight and subtract it from your joint weight to get your dog's current weight. Now that you know your dog's weight, how do you know if it's an appropriate weight for him? Your veterinarian can help you determine your dog's optimum weight. 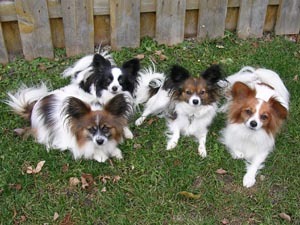 It's different for each dog and depends on the dog's breed, size, temperament, and activity level. Exercise your dog on a regular basis. If your dog is not used to exercise start slowly with short activity periods, and gradually increase the exercise time. Begin with walking and, when your dog shows signs of increased fitness, move to games that require running, such as "fetch." If you are unable to walk and play with your dog daily, consider Dog DayCare on, two, or even five days a week. While there, your dog will have supervised exercise appropriate to his level of fitness. To ensure your dog doesn't overeat don't leave his food bowl out and available to him all day. Instead, divide his daily food allowance into two to four small meals per day. This will not only allow you to know exactly how much your dog eats, he will learn to rely on you for his meals which will strengthen the bond between you. Decrease the number of treats you give your dog, and make sure the treats you give him are healthy. Don't feed your dog "people" food. If you have more than one dog feed them one at a time. This ensures there is no opportunity for one dog to eat from the other dog's bowl, in addition to his own. Make sure that all household and outdoor garbage is covered securely so your dog doesn't have an opportunity to snack from the garbage. Let your friends and neighbors know that for health reasons they should not be feeding your dog. Make sure there is fresh water available to your dog at all times. If your dog is overweight speak to your veterinarian to determine that his weight is not due to hereditary defects or a medical problem. Dog's that are overweight are not usually happy dogs, and as they grow older they may be very uncomfortable as a result of the excess weight they are carrying around. They are also more prone to joint and heart problems as well as skin problems, heat intolerance and a reduced ability to withstand surgery or disease. Remember, the best way to show your love for your dog is to keep him healthy and happy through diet and exercise. Welcome to our Newest Playmates in the SuperDoggie Dog DayCare! 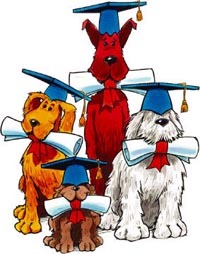 CONGRATULATIONS to some of the Superdog Spectrum's SUPER CLASS GRADUATES! From the Basic Manners Class...Syndel, Marty, Regis, Teddy, Mojo, Ronin, Aspen, Ebony, Percy, Jinx, Louis, Barney, Jake, Freddy, Louie, and Chiffon. From the Better Manners Class...Maggie, Riley, Rusty, Cassanova, Margeaux, Magnus, and Mickey. From the Puppy Gymnastics Class...Bruce, Angus, Monty, Cooper, Loki, Lindsay, Jazz, Hunter, Rudy, Peggy, and Jack. A big THANKS to all the folks who took part in the classes and are helping to make their canine companions better family pets and happier members of the family! For more information on the course available at Superdog Spectrum check out our training page. Strengthening the bond between you and your dog should be just routine. There are a variety of activities you can do with your dog to help strengthen the bond you both enjoy. Even ordinary tasks, like a morning stroll, can make a big difference. When you create a simple routine that's easy to follow and easy to accomplish, bond-building becomes routine in the process. Here are three things you can readily incorporate into a daily routine to develop and maintain a strong relationship between you and your dog - built on love, mutual respect and trust. 1. Take your dog, and just your dog, with you for regular trips out of the home - even if it's to the corner store, a jaunt to the park or a car ride to visit family or friends. Not only does this give you valuable time alone together, but it also helps your dog become socialized - accustomed to meeting other dogs and people. 2. Groom your dog yourself. While taking your dog to be professionally groomed can be a special treat, setting time aside each day to groom your dog is an easy way to get your dog used to being handled and to growing trust for you. 3. Train your dog everyday. For younger dogs, obedience training is essential - since trained dogs require fewer restrictions, are more reliable and can be given more freedom. But training is also a powerful bond-builder because of the amount of time spent with each other and the amount of trust and respect you have to earn from your dog. So for older dogs, it's still important to dedicate some time everyday - for play, exercise or even training for additional tricks. The caring and loving relationship that develops when you bond with your dog makes your dog a true member of the family. It allows his unique and wonderful personality to shine - free from fear or nervousness. And in doing so, it enriches the lives of every family member lucky enough to have him as a companion. It's great for your dog. It's a pleasure for everyone.